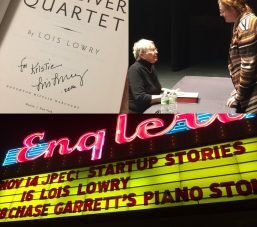 Seeing Lois Lowry speak last night with my two daughters was an experience I will never forget. But it wasn’t simply because she is a famous author and writes award-winning books. The experience was special to me because Lois Lowry was my first introduction to modern teenage fiction and represents a special bond I continue to have with my children. It was the first step in a journey that continues to this day. I have to admit at that time I had never heard of Lois Lowry and I just read the book to make my daughter happy. But I ended up reading it in two evenings and I was enchanted. I needed to read the next one…and the next one. • Being able to discuss literature that your child has chosen to read is a magical experience that will connect you in new ways you never imagined. There is something different about reading every book in the Magic Tree House series together versus having your child bring a more advanced book to you after they have already read it. • Teen literature is a well-loved and greatly appreciated genre of writing in today’s world (many of the successful books are even made into movies). However, I have not met as many adults who realize how enjoyable, educational and inspiring the books can be for them as well. • Teen literature is more relaxing to read than adult literature. While I appreciate a well-written, exciting and complex novel, I often find it exhausting to read something so intense – especially before bed. I enjoy the more innocent feel of the teenage novel that can contain an engaging plot without a lot of extra overly-graphic content. The shorter length is also much more manageable for a busy parent. • Sometimes the best way to connect with your child is to take the opportunities they give you instead of trying so hard to create your own. Lois Lowry is special to me because she was my first step into these discoveries. As a parent of a young teen it was a gift to be given some insight into a private world my daughter enjoyed and to experience her first literary awakenings and thoughts about the complex adult questions posed in the book. She had some of those first conversations about the topics in the book with me. Once I was give a pass into this private world I continued this same tradition with my son and my youngest daughter by “borrowing” whatever they were reading at the time. Two years later, and after my eldest daughter and I had read that first series of Lois Lowry books we made a special trip out of town to see a theatre company perform one of the books on stage. It provided yet another bonding experience for my daughter and I. By this time she was an older teen and the experience was different. She had matured and we enjoyed the show together as a shared memory. Almost 8 years after that I received an e-mail from my daughter, now in college. 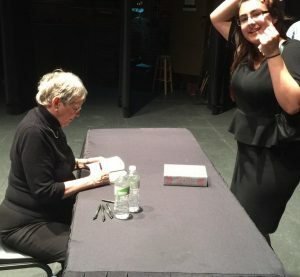 In an action that reflected that first gesture over 10 years ago she, as the teacher, told me about a visit Lois Lowry was making to her campus. And she invited me. Sitting there in the audience I reflected back on the past ten years. Since that first book we shared together my daughter and I had both been through some rough times in our lives and she had also become published herself. She had gone through three years of college and, after some stressful time of indecision, decided that nursing was her passion. I had been in a car accident and she had recently broken her foot, which put even more of a challenge on her as a student with a job as well as classes. 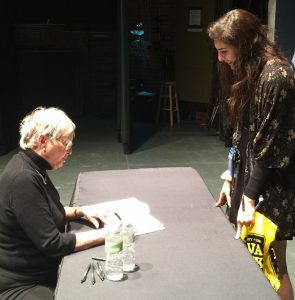 So as we sat there together and listened to Lois Lowry talk about her collection of Kintsugi pottery (Japanese art of fixing broken pottery with gold) we both nodded our heads as she talked about how “things can become more valuable once they are broken”. Hearing her stories about her childhood growing up in Japan reminded me of my own children’s childhood growing up in Arabia and gave me some more insight into how my own children may have experienced their unique childhood. And learning about all the experiences that shaped her as a writer brought a nod of recognition from both of my daughters who have a passion for writing. Finally, the entire experience was a reminder that those bonds we form with our children when they are younger can continue in unique ways and can grow into something even richer. A special experience as a child does not need to be kept in a photo album as a memory. You can build on those experiences with your child as part of the tapestry of your intricate relationship with them.